PlanningAlerts makes it easy to impact what happens to your local buildings, parks, streets, and infrastructure. Over the last 7 years almost 40,000 people have signed up for alerts and thousands of you have made official comments on development applications for everyone to see. But there are more ways to impact what gets built and knocked down. There are people at the council whose job is to understand their community and advocate for people like you who care about it. These people are your local councillors and they work for you. If you want to help shape how your community changes then these are great people to talk to. They can make sure you’re heard at council meetings, find and request information for you, help you organise locals around the issues that matter, and much more. These are powerful ways to have a direct impact—but working with your councillors hasn’t been part of PlanningAlerts … until now. You can now easily ask your local councillors about a development application you care about in PlanningAlerts. This is a new feature that we’ve worked hard to make as simple as possible for you. People living in over 70 council areas around Australia will now see an option to write to their local councillors in PlanningAlerts. Since we switched this feature on, dozens of people have used it and councillors from across Australia have responded. A local councillor’s reply to someones message in PlanningAlerts. 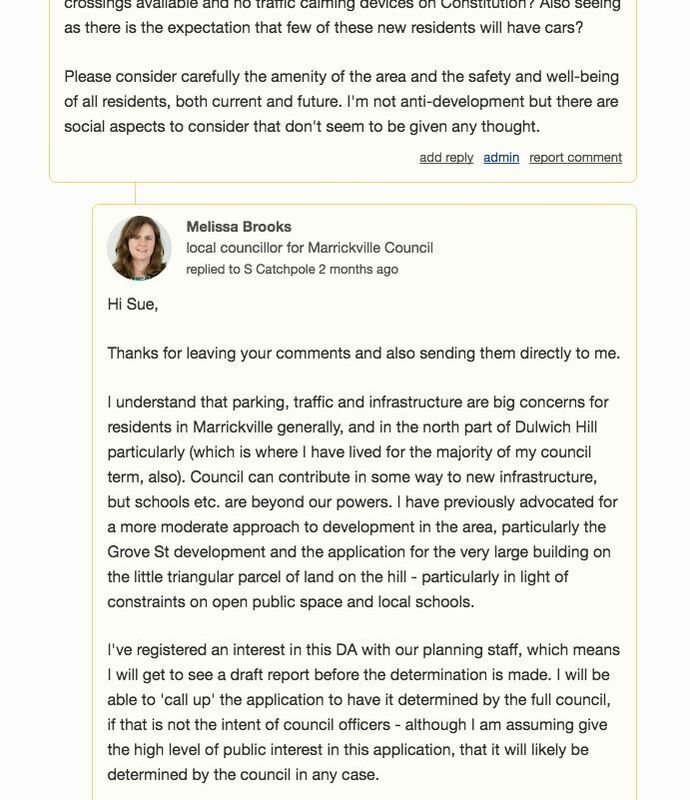 Lots of people do currently write to local councillors about planning, but these conversations all happen in private. In PlanningAlerts the full exchange is public. You can share and discuss what is (or isn’t) said, and hold the people you’ve elected responsible for their action. Everyone can benefit from your questions and the work councillors do to respond. People who’ve never taken the step to make contact themselves can see how easy it is and how helpful councillors can be. A handful of brilliant volunteers have collected councillors’ contact details for 70 of the 150 councils in PlanningAlerts (thank you Pip, Daniel and Katska!). Let us know if your council is missing and we’ll prioritise making this new feature available to you. If you’d like to help collect local councillor information, please contact us—we’d love your help to make this available to everyone. Now it’s time to put your councillors to work for you through PlanningAlerts. 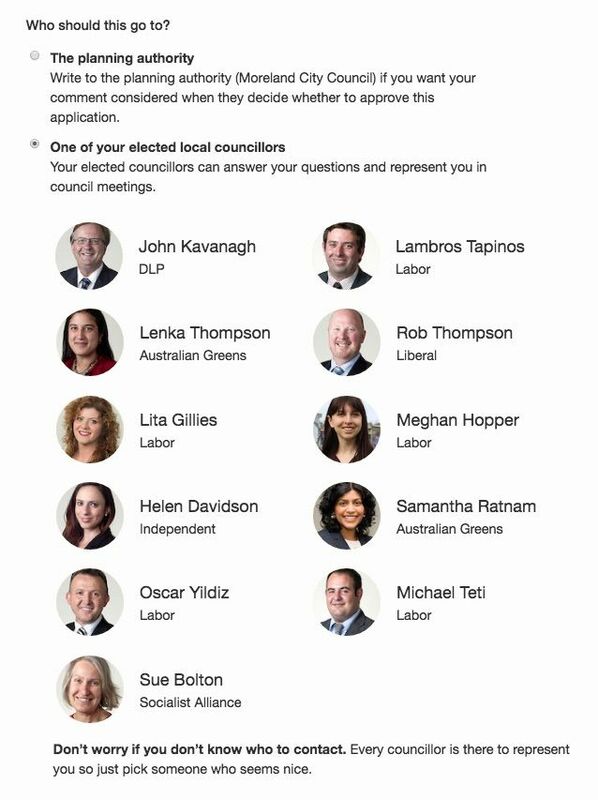 This entry was posted in Announcement, PlanningAlerts.org.au and tagged councillors, development, local democracy, local government, local planning, planningalerts. Bookmark the permalink. Post a comment or leave a trackback: Trackback URL.